As a parent, it can be hard to juggle your child’s schedule and the rest of life’s responsibilities. Sometimes, a quick way to save time is by giving your child pre-packaged snacks to eat while you are out and about. However, some of the most common types of children’s snacks are terrible for teeth, and can lead to cavities. Below, we point out which foods to stay away from to keep your child’s teeth healthy and cavity-free. Starchy snacks like crackers, chips and cookies can damage teeth. Starchy foods can get stuck between teeth and stick around long after a meal concludes, and that’s the problem – starchy foods stuck on teeth provide bad bacteria with sugar, which powers the bacteria to multiply and attack enamel. Regular brushing and flossing usually takes care of sticky starches, but sometimes that’s not completely effective. If your child has a starchy snack, make sure they swish cool water in their mouth 30 minutes after they snack to get rid of any food debris that can lead to cavities. Fruit is always good, right? Well, not necessarily. A lot of canned fruit is packed in syrup that contains unhealthy amounts of sugar. Excessive sugar can lead to cavities, and many more health issues if your child eats it too frequently. When you are shopping for canned fruit, look for those that have no added sugar or those packed in 100% fruit juice. But the healthiest way to enjoy fruit is by eating fruit that hasn’t been altered in any way. Dairy products like milk, cheese and yogurt are a great source of calcium, which plays an important role in strengthening teeth. In fact, your body stores 99% of its calcium in your bones and teeth! Milk and dairy products reduce tooth decay by strengthening tooth enamel – the first line of defense against cavities. 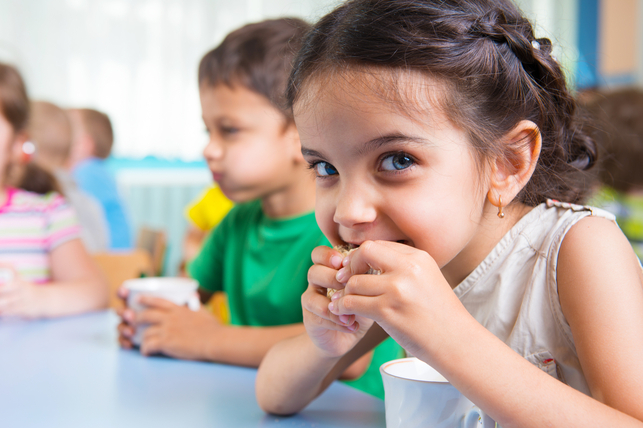 You can help your child keep their tooth enamel strong by getting plenty of dairy products and calcium. Try giving them all-natural string cheese, nonfat yogurt, or milk to increase their dairy intake and strengthen their teeth. Avoiding cavities begins with proper, routine oral care. The American Academy of Pediatric Dentistry advises that everyone brush his or her teeth twice per day, for two minutes each session. Have your child follow this routine to build a healthy smile. It can be tough to convince your child to brush for the full two minutes, but there are some fun ways to help them achieve better brushing results. Go Online to find tooth brushing videos for children. Most of these videosare at least two minutes long, and help keep kids engaged and focused while they brush. Visit our office for more teeth cleaning tips, and to help your family get a healthier smile.